No more freezing. Down jackets are the ideal clothing to keep you warm when temperatures are exceedingly low. Maximum thermal output at very low weight - sometimes nothing can excel nature's ways. For women and men, for expeditions, snowshoeing tours, trekking tours and for casual use - we have down jackets and down coats for every need. If you want to avoid the cold then check them out! Professional down manufacturers like Bergans, Canada Goose , Mammut and Vaude not only have down jackets and down trousers for women and men, they also have special down jackets for kids, down hats and down suits in their range. Underneath their tougher exterior feathers many birds have a layer of down, which enables them to maintain their body temperature despite water and low temperatures. One kilogram of down consists of up to 500,000 single down feathers, which have an extraordinary potential to insulate because of their unique structure with soft, long, radial feather-branches. In winter, down jackets are the ideal companion for many occasions: ultra-light and thin down jackets are great for hiking and climbing and fashionable designs provide a warm and stylish look for heading into town. Thick, waterproof down jackets get you through the toughest alpine tours at icy temperatures. No matter if you plan an alpine tour under extreme conditions or want to do your Christmas shopping in an outdoor mall - down jackets are great companions in all situations when you are in a cold environment and aren't moving at a level that will get you into sweating. There is only one limit: down jackets are not suitable for rainy weather. On the one hand down won't keep you warm anymore when it is wet. On the other hand rainy weather is normally simply too warm for jackets with down lining. Depending on the use of the different designs, the focus is on certain aspects of the products. Designs for everyday purposes have a fashionable cut and a lining with a small or medium amount of down. For mountaineering at extreme temperatures optimal weight and pack size is important, but thermal output also needs to be as high as possible.Hybrid jackets combine the advantages of down with the advantages of synthetic fibers: For parts of the body that are more likely to sweat, synthetic fiber is used. The part for the torso, which should be kept as warm as possible, is made from dawn. What does bulking power, cuin and information such as 90/10 stand for? With an increasing value that is indicated for bulking power, the amount of insulation and warmth that the jacket offers in comparison to the packable volume rises. This value is measured in cuin (cubic inches). It indicates the volume to which a certain amount of down expands again, after it was squeezed into a measuring cup for 24 hours. 700-800 cuin are excellent, 600-700 very good. Values below 500 show that there is a much lesser capacity of insulation. Down (90/10) means for example that the down jacket is lined with a mix containing 90% down and 10% feathers. This is a very good ratio since a certain amount of feathers needs to be added to the down in order to stabilize it and prevent them from clotting. A rule of thumb says: clothing for extreme conditions should have a ratio of at least 90/10, for other recommended use 80/20 is already sufficient. The amount of down that fills the jacket is measured in grams. The more it contains the thicker and warmer does the jacket get. Recommendation: when buying a down jacket, check the details in the product description. Cut of the jacket Does a light fleece fit underneath it? Zipper Do they run smoothly? Does it have protection so the zipper does not get caught in fabric? In the case of most Down jackets, the outside is made from very light and sensitive fabric - zippers could get caught and cause damage. Weather protection: Normally down jackets are not windproof, only water repellent. It is an important Question whether the jacket fits under a hardshell. Insulation A jacket that you plan to use at low temperatures should not have any quilted seams. Seams such as these function as cold bridges and reduce the insulation of the jacket significantly. Handling Zippers and draw cords (i.e. for the hood) should be adjustable when you are wearing gloves. The basic decision: Do you prefer a jacket from down or synthetic fiber? Compared to synthetic fibers down has a higher thermal output, weighs less and safes space when packed. Down can show its advantages in places where it is very cold. 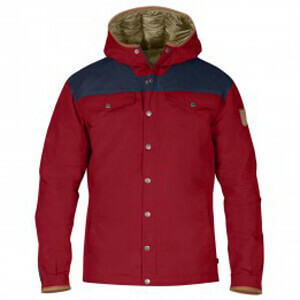 The disadvantage Down jackets, unlike synthetic jackets, are more sensitive to water. If the feathers get wet they can start to clump and lose their insulating effect. For activities during which you are sweating permanently or for activities in rainy weather the synthetic fiber jacket should be your first choice.